Germany has asked for less detail on the UK’s future economic and trade ties with the EU, according to Bloomberg. It comes as European Commission officials attempted to block EU27 diplomats from joining UK government “technical seminars”. Sterling has jumped this afternoon following reports that Britain and Germany are set to drop key Brexit demands. The pound spiked against the dollar and was up almost 1 percent at 1.29 on the day. Versus the euro, the British currency gained 0.5 percent to hit 1.11. 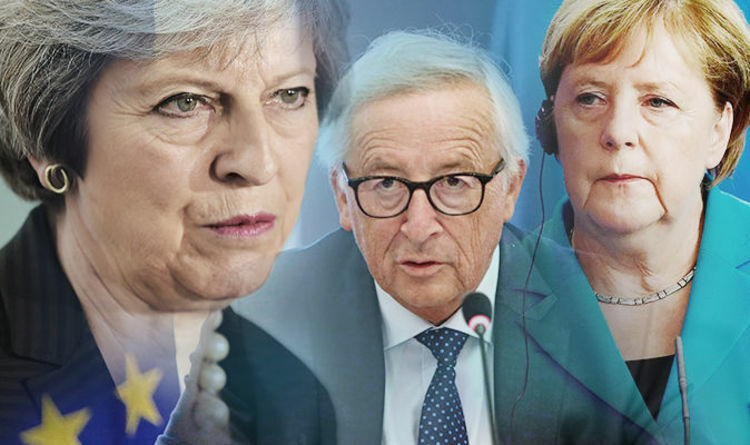 Both British and German governments have abandoned key demands over Brexit, report Bloomberg. Sources say Angela Merkel is ready to accept a “less detailed agreement on the UK’s future economic and trade ties with the EU”. According to IHS Markit and the Chartered Institute for Purchasing and Supply for the services industry, companies are being held back from carrying out their activity by the labour shortage. Jeremy Thomson-Cook, the chief economist at WorldFirst, said: “Another day, another survey showing Brexit uncertainty weighing on a part of the UK economy”. Chris Williamson, the chief business economist at IHS Markit, said the drop in confidence was to the lowest levels seen since the EU referendum. Mr Barnier is drawing up a rival Brexit plan to the government’s Chequers plan. The plan is more in line with a Canada-style trade deal. During the heated debate, Mr Corbyn said: “The Chequers proposal is dead, already ripped apart by her own MPs. “When will the Prime Minister publish a real plan that survives contact with her Cabinet and with reality? Ports in the north of England are preparing for an increase of freight as shipping companies try to find alternatives to Dover after Brexit as they are concerned of long queues. Associated British Ports said: “Cargoes originally destined for ports such as Dover are moving increasingly north as trade partners look at alternatives to mitigate any difficulties the more traditional routes may experience in future”. The former Brexit Secretary is ready to get behind an alternative to the government’s Brexit strategy. Mr Davis is set to endorse the proposals for an advanced free trade agreement after he said that the Chequers plan would be “almost worse than staying in the EU”. Mr Davis’ plan is scheduled to be published later in September and will make the case for a Canada-style trade deal. Doctors claims that the NHS bill for hiring non-UK staff could hit £500 million after Brexit. The Royal College of Physicians have said that the costs of recruiting EU and non-EU staff could more than triple from the current £150 million a year if the freedom of movement ends after Brexit. This money would be needed to pay for visas to enable staff to work in the UK and for the immigration health surcharge.